Two Missouri women were arrested for spray-painting shoot-the-cop-in-the-head graffiti in several locations in Poplar Bluff. The women were posting the policeman emoji with a gun to his head. Poplar Bluff police have arrested two women in connection to a series of acts of vandalism that depict violence against police officers. On Thursday, officers responded to several different locations in Poplar Bluff in reference to reports that anti-Police graffiti had been spray painted on structures. 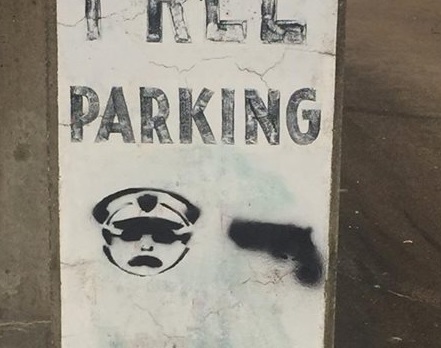 The graffiti depicted a Police Officer ‘emoji’ with a handgun pointed at his head. Police say people started calling on Thursday morning after they spotted the images spray painted at a skate park and parking garage downtown, and in at least two different spots along the running path through Hendrickson Park. “We will investigate this as a terroristic threat,” said Poplar Bluff Police Chief Danny Whiteley. Similar images popped up in Houston, Texas a week ago around the time a gunman shot and killed a Harris County sheriff’s deputy while he was pumping gas. On Friday, officers and investigators conducted a follow up investigation at a residence in Butler County. Crystal Glass, 22, of Ellsinore, and Hannah Allison, 21, of Poplar Bluff, were taken into custody without incident. Glass and Allison were booked on charges of property damage.